QPR caretaker boss Gareth Ainsworth says promotion to the Premier League is possible if the club play as they did against Manchester United on Tuesday. The Hoops narrowly lost the Carling Cup tie 1-0 but Ainsworth saw plenty of potential in his team's performance. "If we play like that we can get into the Premier League and come here regularly," he told BBC London 94.9. "This is what we could have, this is what we can achieve. I'm sure for every QPR person, that's what we want to do." Former Hoops player Ainsworth has won two, drawn one and lost one match since taking over from Iain Dowie last month, but the club have yet to name a permanent replacement despite a number of high profile names being linked to the manager's position. Ainsworth admits he has experienced a lot and has had to learn fast in his short time as caretaker boss - but he also feels things are working well so far. "I am on the first rung of the ladder but I'm learning quickly and coming to places like this is going to be good for me," he said. "At the moment things are coming off for me". 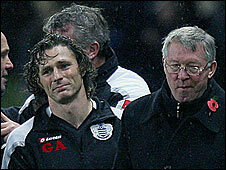 QPR held out for 76 minutes before they were undone by a Carlos Tevez penalty at Old Trafford but Ainsworth hopes his players will use the experience as motivation to push for promotion from the Championship this season. "They've all had a taste of what the Premier League's about - I think there's been a lot of shirt swapping going on - Emmanuel Ledesma would love Tevez's shirt!" he said. "The lads are working really hard for me, without them I've got nothing without their belief in me and my belief in them. "If that keeps on and we keep playing like we did tonight (against Manchester United) then we can really achieve something."